Here is my last little bit of coverage from NYFW, but ladies, it’s a good one. 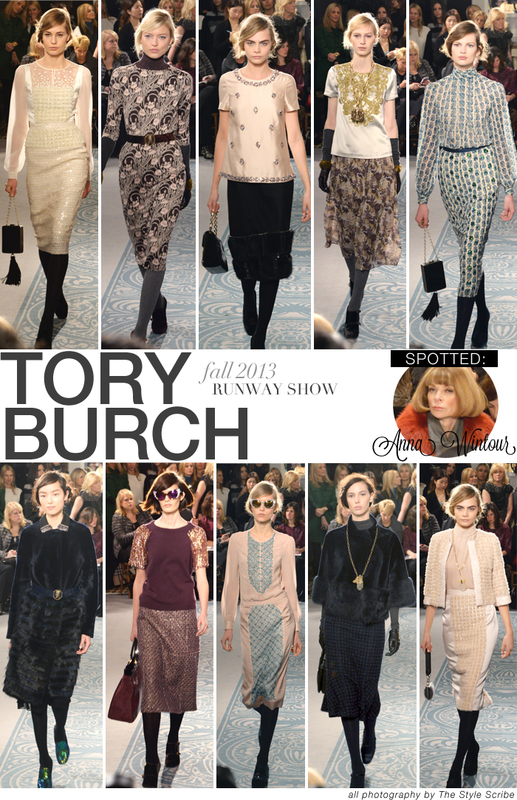 My favorite runway show I attended this season was Tory Burch. The venue itself was a gem and the music really got the flow going. As far as the clothes coming down the runway? Embellished tops and skirts, sparkly tweed suits and dramatic fur pieces took over and I loved it all. The palette was soft pink, burgundy and navy, with fun accessories like dragonfly necklaces and iridescent pumps. Can’t wait for it all to be available! Not to mention that fashion week is not complete without an Anna Wintour spotting I got a clutch shot of her without her sunnies. PS – ToryBurch.com is having a MAJOR sale this weekend for Presidents’ Day! Enter code WEEKEND to get 25% off your purchase of $400 or more and free shipping! Click here to shop the current collection – their beachwear pieces are also not to be missed!